The first Friday Showcase for 2014 of The Quilters' Guild of NSW Inc., will have Sydney quilter Beverly Hunter as Guest presenter. 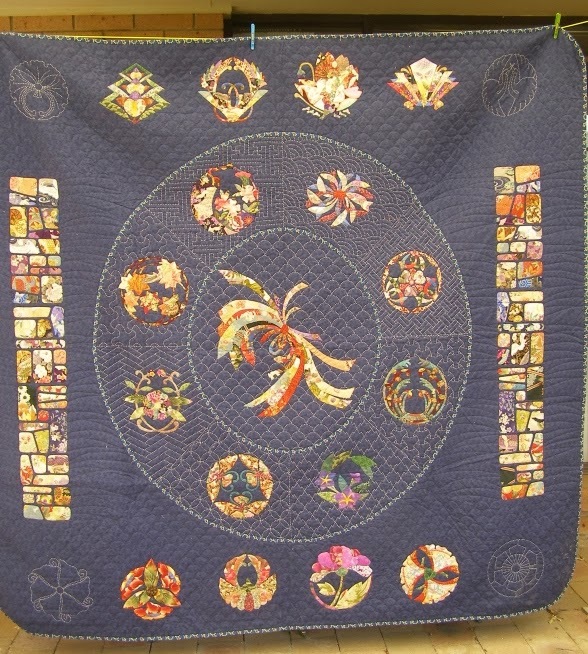 Bev is a frequent attendee at Friday Showcase and is always complimentary about the creative pursuits of fellow quilters, however, as can be seen by these images, Bev is herself, an extremely accomplished piecer, applique devotee and hand quilter. She particularly enjoys the peace and tranquility that hand work involves, having first raided her extensive scrap bag, considered her colours, and designed fresh settings and placements to traditional block designs. This careful and methodical approach has resulted in her quilts winning prizes at the many quilt shows she enjoys exhibiting at. Please come and share in the visual delight of Bev's Quilts ... as she says ..."Quilts do the talking"
2014 Quilt Show Volunteer Form ( 94 KB PDF). The closing date for entries is Friday 14 March 2014. Please direct any queries to the Exhibition Secretary. To enter a quilt in the Sydney Quilt Show, you must be a member of the Guild for the financial year. Membership is due 1 July each year for the year ending the following June. Download a Membership Application Form ( 196KB PDF). Utilising just reds, blues and white, the pieces for this block are easily rotary cut, with one unit taking less than 1/2 hour to construct. Please refer to page 30 of The Template November 2013 for accurate piecing instructions. or : Bring blocks to the Burwood Meeting on Saturday 15 February and hand in at the Welcome Table. All blocks go into the draw, and winner takes all. With "Modern" quilts being the buzz word of late, it is worth exploring just how some quilts are attaining this new label. 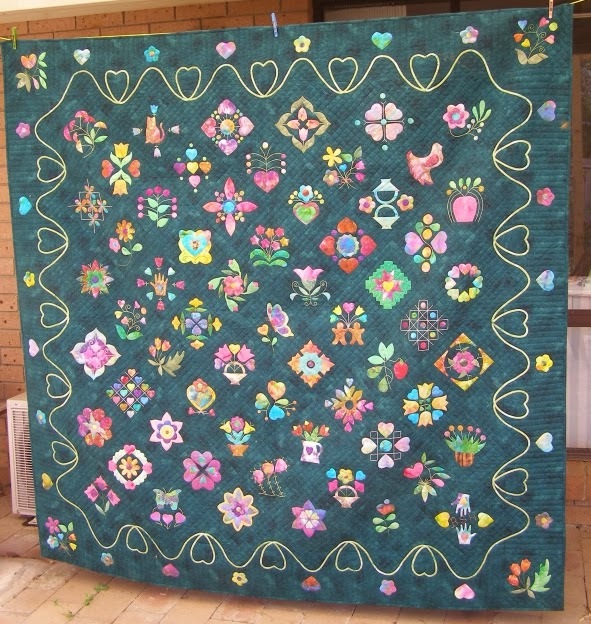 The 9-13 July 2014, Glebe Island, Sydney Quilt Show has a rephrased Open Category Exhibition component : Modern - New Traditions from Old Favourites. How can we as exhibitors or attendees accurately interpret and appreciate the subtleties of these entries? Pared back colour schemes : Less is More! The Guild Library is bursting with ideas. "Old" and Traditional designs can become Modern and Dynamic, just with a shift in interpretation , and these publications can spin one's thinking into new directions.